Apple today announced financial results for the third calendar quarter and fourth fiscal quarter of 2016. For the quarter, Apple posted revenue of $46.9 billion and net quarterly profit of $9 billion, or $1.67 per diluted share, compared to revenue of $51.5 billion and net quarterly profit of $11.1 billion, or $1.96 per diluted share, in the year-ago quarter. Gross margin for the quarter was 38 percent compared to 39.9 percent in the year-ago quarter, with international sales accounting for 62 percent of revenue. Apple also declared an upcoming dividend payment of $0.57 per share, payable on November 10 to shareholders of record as of November 7. The company currently holds $237.6 billion in cash and marketable securities. For the quarter, Apple sold 45.5 million iPhones, down from 48 million in the year-ago quarter. iPad sales were down to 9.3 million from 9.9 million in the fourth quarter of 2015, and Mac sales fell to 4.9 million from 5.7 million. For the full fiscal year, Apple generated $215.6 billion in sales with $45.7 billion in net income, down from $233.7 billion in sales and $53.4 billion in net income for fiscal 2015. As predicted, 2016 marks the first full-year revenue decline for Apple since 2001. Apple's guidance for the first quarter of fiscal 2017 includes expected revenue of $76-78 billion and gross margin between 38 and 38.5 percent. Apple will provide live streaming of its fiscal Q4 2016 financial results conference call at 2:00 PM Pacific, and MacRumors will update this story with coverage of the conference call highlights. 3:01 pm: The conference call has concluded. 2:59 pm: Maestri: "Let me give you some details on both a sequential and YoY basis -- because I think that's where there may be some disconnect over last year's margins. We had both 38% in the June and September quarters, and we're guiding slightly higher in the December quarter because of improved mix, but this will be partially offset by supply constraints and other factors. […] Last year, we had a patent infringement award for $548 million. […] I think it's very important for investors to understand that over the last two years, the U.S. dollar has appreciated 15% over a basket of foreign currencies. […] At some point the strong dollar becomes the new normal and we need to work with that. I think over the years we've made good tradeoffs and our gross margins have remained very stable over that time. 2:56 pm: Q: "Luca, I wanted to ask about the gross margin guidance. I think we were expecting something a little higher -- it's about 50 basis points lower. I'm just curious, is there something going on with pricing or mix going on there?" 2:55 pm: Cook: "I think it's important to look not only at per-capita income, but sort of look at the number of people who are or will move into the middle class of India over the next decade. The age of the population of India -- over 50% of the population is under 25. You have a very, very young population. The smartphone has not done as well in India [as in China], but one of the reasons is the infrastructure has not been there. But this year, and next year, there are enormous investments going into 4G networks. We are working hard to deliver that great experience for customers. I see a lot of factors moving in the right direction there. I think the government is a lot more focused on the infrastructure and creating jobs, which is fantastic, because you really need that. Will India will be as successful as China? India's population should exceed China's over the next decade, but I think the GDP will be slower. I think the reality is there will be a lot of people in the middle class there that will want a smartphone, and I think we can compete well there. There's a lot of headroom there, and we're working very hard to realize that opportunity." 2:51 pm: Q: "Do you see India at one point being as big of an opportunity as China?" 2:50 pm: Cook: "I suspect whenever there are a large number of customers with a phone that is around two years old -- that seems to be the sweet spot -- there will be carriers trying to recruit those customers." 2:50 pm: Q: "Tim, there year we saw carrier incentives come back to force with iPhone 7 and iPhone 7 Plus. Two years we saw a huge upgrade push surrounding iPhone 6 and iPhone 6 Plus. Do you think carriers worry about customer churn every two years?" 2:49 pm: Cook: "In terms of the ASP, the way we think about it is we want to charge a fair price. We don't want to charge more than that." 2:48 pm: Q: "Do you see more and more features being added to iPhone? Do you think you are at a point where iPhone ASPs (prices) could rise if these features are added?" 2:47 pm: Q from UBS' Steve Milunovich about Apple's product pipeline, to which Cook says Apple has the "strong pipeline it has ever had" but "as usual, it isn't going to talk about whats in it." 2:46 pm: Q from Steve Milunovich with UBS about changing ASPs, to which Maestri says those changes should be less going forward. 2:45 pm: Cook: "I think people would like to have an assistant on them at all times. We live in a mobile society. People are constantly moving from home to work to other things that they may be doing. The advantage of having an assistant on your phone is that it's on you all the time. That's not to say there isn't a nice market for a home assistant, but I think from a balance point of view, the usage of an assistant on the phone would be much greater. In fact, if you look at Siri today, which is accelerating with iOS 10 and on the Mac, we've been getting 2 billion requests per week. Siri is very large, and to our knowledge, we've shipped more assistant-enabled devices than anyone out there. Our focus is worldwide -- not just the U.S., but delivering a great experience globally. We've put a lot of effort into doing that. In terms of the balance between AI and privacy -- this is a long conversation -- but from a high level I think it's a false tradeoff that people think you have to give up privacy for AI to do something for you. We don't buy that. It may take a different kind of work, it might take a different kind of thinking, but I don't think we should throw our privacy away. It's kind of like the old-age debate about privacy vs. security -- it shouldn't be about making a choice." 2:42 pm: Q: "Tim, we've seen an increasing focus on artificial intelligence in products such as Google Home or Amazon Echo? And there's also Siri. How do you think about balancing AI with security?" 2:40 pm: Cook: "We've started on some original content as you mentioned. It's a great opportunity for us both from a creation and ownership point of view. It's definitely an area we're focused on." 2:39 pm: Q: "Cook, you've talked about interest in the TV. Can you elaborate on that? Additionally, what's been happening given acquisitions, how broadly do you think about the content that Apple has started creating itself on a limited basis? Do you think content creation or ownership is important for Apple, or do you think Apple is more focused on the ecosystem and distribution?" 2:38 pm: Maestri says extra competition is not a concern to Apple regarding the iPhone because it cannot supply enough units to keep up with demand. Apple feels confident about its trajectory going forward for the company and the iPhone. 2:36 pm: Cook: "We are open to acquisitions of significant value that can help improve products for our customers." 2:35 pm: Huberty: "Can you give an overall view of acquisitions that might be larger than normal?" 2:35 pm: Cook: "The fiscal year 2016 performance was hurt by the devaluation of the Chinese currency. If you look at what happened in fiscal 2015 in China, we had a surge of upgraders that came into the market for iPhone 6 or iPhone 6 Plus, and the upgrade rate increased relatively more in Greater China than elsewhere around the world. So when that upgrade rate returned to a more normal upgrade rate in 2016, revenue fell. That created another issue for us, because we didn't forecast that accurately, so in Q1 last year we put in too much channel inventory and have been adjusting channel inventory in the quarters that have followed. Looking forward, the response to iPhone 7 and iPhone 7 Plus has been very positive. It's very hard to gauge demand when you are selling everything you are making, but we'll learn more through this quarter. We are confident enough to provide guidance that we are returning to growth this quarter. Beyond the 90-day quarter, we are very bullish on China. We are seeing a booming middle class. The LTE adoption rate is still fairly low -- around 45%-50% or so -- and we continue to have a really good opportunity in China. We continue to focus significantly on China." 2:31 pm: Shannon Cross from Cross Research: "Can you talk a little more about China?" 2:30 pm: Cook: "There is clearly some R&D spent on products that are in the development phase and haven't reached the market. That's a part of it. We feel really great about the things we've got. We've put a lot of emphasis on our services category and making the ecosystem even better. We're confidently investing in the future and that's the reason you see the R&D spend increasing." 2:29 pm: Huberty: "What should we read into the fact that R&D has grown 3x while sales have grown about a fifth of that? Is this incremental spend for products that haven't come to market yet?" 2:29 pm: Maestri: "We think we can grow this year. The interest from customers towards iPhone 7 and iPhone 7 Plus is very strong. The strength of our services category is very strong. You mentioned the extra 14th week and the few extra days in the quarter do help us, but there are other factors that offset that. […] We are very supply constrained on iPhone 7 Plus. We are more supply constrained at this time compared to a year ago. Apple also had a one-off award of $548 million [from patent lawsuit vs. Samsung] last year, which was a one-off amount. When you take into account all these factors, we believe our guidance is good for the December quarter." 2:27 pm: Katie Huberty from Morgan Stanley: "Luca, can you help us understand what's embedded in revenue guidance for the extra week of the December quarter?" 2:26 pm: Tim Cook: "In the car space, there are a lot of technologies that will become available or will be able to revolutionize the car space. Certainly nothing to announce today." 2:25 pm: Gene Munster from Piper Jaffray: "What advantage could Apple have in the auto space?" 2:23 pm: Maestri has opened the conference call to questions from the media. 2:23 pm: Apple expects revenue to be between $76 and $68 billion in the December quarter, up from $75.9 billion in the year-ago quarter, signaling a return to growth during the upcoming holiday shopping season. 2:22 pm: Maestri: Apple has now completed $133 billion in share repurchases. Apple made four acquisitions during the quarter. Effective tax rate was 26%, slightly higher than 25.5% guidance. 2:21 pm: Maestri: Apple has returned over $9 billion to investors during the September quarter, including $3.1B in dividends and equivalents and $3 billion ASR. 2:21 pm: Maestri: IBM reports that PCs are 3x the cost to manage than Macs. Much lower support costs and higher residual value help IBM save as much as $535 per Mac vs. PC over the span of four years. 2:19 pm: Maestri: Corporate buyers report a 94% satisfaction rate with iPad. 2:19 pm: Maestri: iPad sales were 9.3M in the September quarter. Apple is "highly successful" in tablet market with 82% market share of tablets priced above $200. 2:17 pm: Maestri: Apple saw double-digit growth in several services categories beyond the App Store. 2:17 pm: Maestri: App Store revenue has accelerated for five consecutive quarters. 2:16 pm: Maestri: iPhone customer satisfaction in U.S. remains strong. 451 Research found that among consumers planning to purchase a smartphone within the next 90 days, 60% plan to purchase iPhone. 2:15 pm: Maestri: iPhone ASP increased to $619 in September quarter, above Apple's expectations. Up from $595 in the June quarter when Apple launched iPhone SE and had significant channel inventory reduction. 2:15 pm: Maestri: iPhone performance in China in December quarter will be better. 2:15 pm: Maestri: Strong iPhone growth in many markets, including Canada, Latin America, Central Europe, Middle East, India, and South Asia. 2:14 pm: Maestri: 45.9M iPhones sold in quarter. 2.7M iPhones were in transit at the end of the quarter. 2:13 pm: Cook thanks Apple's employees for a great year and turns the call to Apple's CFO Luca Maestri. 2:13 pm: Cook says Apple is pleased with its enterprise efforts, including a recent partnership with Deloitte that will see Deloitte creating an Apple practice with more than 5,000 "strategic advisors" focused on providing businesses with guidance on how to "change the way they work," updating technology on all of their systems, from retail to R&D to inventory management. 2:12 pm: Cook: iPhone sales in India were up over 50% year-over-year in fiscal 2016. 2:11 pm: Cook cites the Proactive features of iOS 10, advanced facial recognition capabilities of its camera software, and Siri as examples of areas where it has applied machine learning. 2:10 pm: Cook says machine learning is making Apple's products and services smarter and more personable. "We've been using these technologies for years to create better user experiences, and we've invested in it heavily through both R&D and acquisitions." 2:09 pm: Apple expects over 100 HomeKit-compatible products to be on the market by the end of this year. 2:09 pm: Cook reiterates recent software updates: iOS 10, macOS Sierra, watchOS 3, and tvOS 10. 2:07 pm: Cook says iPhone 7 and iPhone 7 Plus demand continues to outstrip supply, but Apple is working hard to get the smartphones into the hands of its customers. 2:07 pm: Apple remains confident about the future of its services department. Cook cites the loyalty of Apple's customer base. 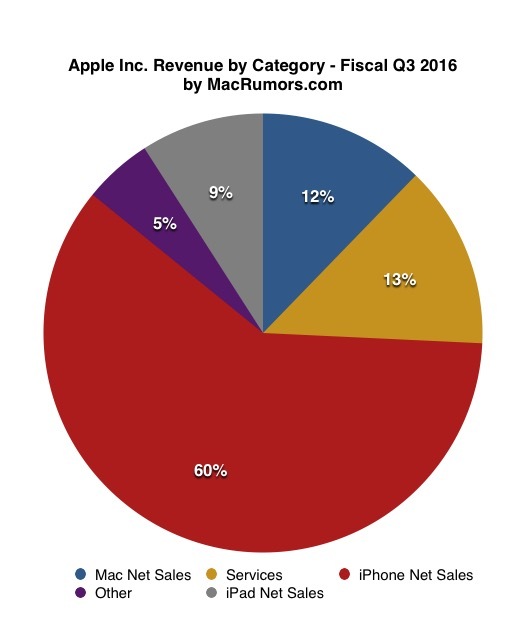 Apple expects its services category to become the size of a Fortune 100 company in fiscal 2017. 2:06 pm: Apple is seeing a strong volume of transactional volume with Apple Pay around the world. Transactions up nearly 500% year on year for the September quarter. September quarter saw more Apple Pay transactions completed than in entirety of 2015. 2:05 pm: Cook says he expects a strong response and rapid adoption of Apple Pay in Japan. 2:05 pm: 2016 saw the biggest number of Android switchers to iPhones of any year ever. 2:04 pm: Cook says iPhone sales were up year-over-year in 33 of Apple's top 40 markets. 2:04 pm: Tim Cook begins the call by saying Apple is excited about its upcoming "Hello Again" media event on Thursday. 2:02 pm: Apple's earnings call is about to begin. 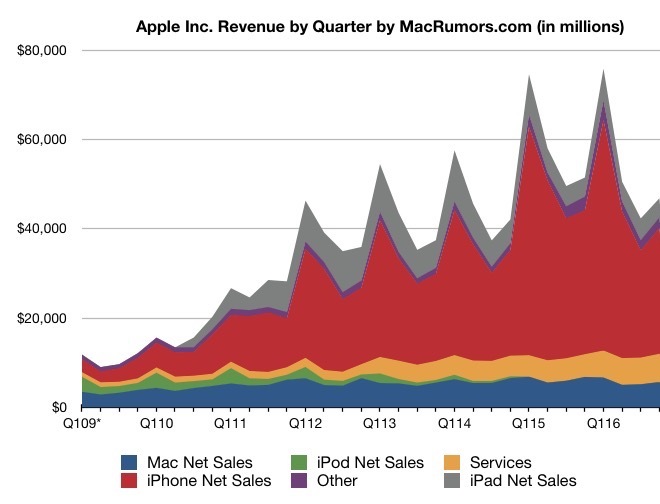 Apple still made a crapton of money. But after 15 years, they had their first full-year revenue decline. It's better than expectation with old products. No new Mac mini, no new Mac pros, no new iPad Air, no new iPad mini, no new iPod, no new Apple TV, no new Apple TV services, no new features on Apple watch, no new iMacs... What all Apple employees have done for a year is building the spaceship, expanding showrooms, and making new watch bands. Nice job on making billions in profit Apple. Keep it up.. like, release an iMac and Mac Pro for example. That's a massive drop in iPhone sales. Especially for a major iPhone update as opposed to an 'S' upgrade. Over a 5% drop, ouch. Only 2 weeks of iPhone 7 sales are included. It was actually about 500,000 units more than analysts were expecting. Both hyperbole extremes, "oh noes, Apple is doomed!" and "Apple's doing great! No worries!" are not helpful and miss what is going on. When a company that was riding high falls, it usually falls quickly and it falls hard. To dismiss flat or a slight downturn is to do so at their own peril. Apple doesn't need to panic, but one could make the case that there are some issues with their product lines that have gone unaddressed for a bit too long. Hopefully the Oct 27 presentation will be the first in many steps towards addressing those issues. Get ready for that Apple Spin boys ! GREAT products coming down the pipe line! We have a great interest in that!